Blackstone Waterhouse Congratulates 2 Newly Admitted Solicitors! Blackstone Waterhouse is proud to congratulate 2 of its newly admitted solicitors in February 2019. For almost 40 years, the ‘True Rule’ in Codelfa has provided that a Court cannot look outside the plain wording of a contract unless it first finds some ambiguity in the drafting of an agreement. Blackstone Waterhouse is acting for a major developer in a special leave application to the High Court on 22 March 2019 in respect this fundamental principle of contract law. If leave is granted, the proceedings will impact all parties to commercial contracts. Watch this space! David Armstrong joins us in February 2019 to bolster our Construction & Infrastructure Group and major project dispute resolution capability and lead our insolvency and finance service offering across the firm’s clientele in planning, property and construction. Power to the Purchaser. Vendors: Are You Ready? The Conveyancing Legislation Amendment Bill 2018 (Bill) was assented in November 2018 to provide added protection for purchasers by clamping down on the ability of vendors to make changes to key documents after exchange of off-the-plan (OTP) contracts. Blackstone Waterhouse is proud to announce the appointment of Danny Arraj, Managing Partner, to both the Planning Committee and the Land Committee of the Urban Development Institute of Australia (UDIA NSW). Blackstone Waterhouse Recognised as a Leading Firm in Construction – Again! 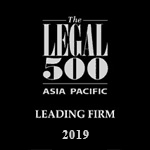 Blackstone Waterhouse is proud to announce that our expertise in Construction & Infrastructure has been recognised in the 2019 Asia Pacific Legal 500 legal directory survey—for the second year running. A rare opportunity to join one of the industry’s most highly regarded teams. Blackstone Waterhouse is proud to announce that one of our own has been shortlisted for one the legal industry’s most prestigious awards.